Liwaa Yazji is a film-maker, poet, playwright, scenarist and translator. She was educated in both English Literature and Theater Studies in Syria. She is a board member of Syrian cultural organization "Ettijahat-Independent Culture". Her first play "Here in the Park" was published in 2012 and her poetry book "In Peace, we leave Home" in 2014. 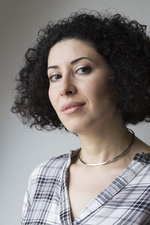 Liwaa Yazji published a translation of Edward Bond`s “Saved” into Arabic in 2014. She worked a script doctor for several pan Arab companies and wrote the script of the pan Arab series “The Brothers” which was broadcasted on many channels and still on from 2014. She was a resident poet at the Poets House- New York in 2015 to work on a poetry collection which was published under the title “Three Poems” at CECartslink & Martin Segal Theatre Center Publications in 2016. Her play “Goats” had a staged reading at The Royal Court Theatre in March 2016, and set to be premiered in 2018. And her play “Q&Q” premiered at the Birth Festival at The Royal Exchange Theatre, Manchester in October 2016. Her first documentary "Haunted" was released in 2014 and premiered at FID Marseilles where it got the Mention Special in the First Film Competition, has since then been commissioned for other festivals and screenings, and recently received the Al-Waha Bronze award at GIGAF festival, Tunis. Liwaa Yazji served as a jury member at Freistadt International Film Festival 2016 - feature documentary competition. She is currently co-writing HEIM, a TV series to be produced in Germany.